On Sunday, October 12th more than 25 members of Boston Handmade will be featured at the market in Boston's South End neighborhood in a special fall outdoor presentation of handmade art and craft. Come check us out at Boston's most vibrant weekly outdoor event! 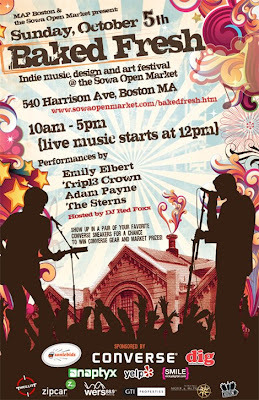 The Sowa Open Market is an open-air arts market in the South End of Boston that I started 5 years ago. It is open every Sunday, mid May through the end of October. The market takes place in a huge parking lot in the heart of the ultra hip Sowa arts and media district at 540 Harrison Ave. Our vendors consist of fine artists, craft artists, designers, musicians, specialty food sellers, farmers and much more. What did you do before you started the South End Open Market? I studied graphic design in college, worked for a bit in the industry, but got bored quickly. So I then decided to freelance and bar tend on the side. Can you briefly share anything about your plans for the future of the market? Last year we added two new locations: Providence and Mashpee. This season we are adding the Prudential Center Artisan Market (inside the Prudential Center Mall) on Sundays, November 2 through December 21. 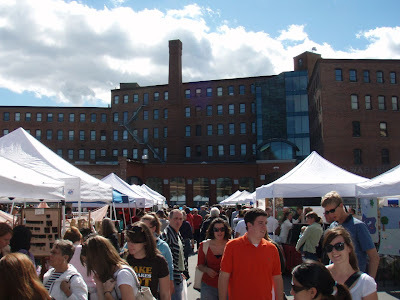 New to the Sowa Open Market in 2009 will be the weekly addition of the Sowa Antiques Market, hosted by New England Antique Shows inside the historic T building at the back of the lot. 50-70 antique vendors will be setting up shop each Sunday. The open market artists, crafters and farmers will remain outside. We are also working on a new northern New England city location, but I can’t say where just yet. What is Baked Fresh on October 5? Baked Fresh is a collaborative effort with Morgan First of Map Boston and myself. The two us got together this spring and brainstormed on an event that would draw a younger demographic to the Sowa Market. There will be 120 vendors targeting a younger audience, selling affordable edgy art, silk screened tees, home goods, jewelry, posters and prints etc. Plus it’s an Indie music festival featuring 4 up and coming bands with a DJ spinning between live sets. Kind of like open market poolooza. Its going to be a an awesome event! What free time? When I do have a moment I spend it with my partner Ed (we got married this past Saturday) and my dog Tucker going for long walks. I also love trying new restaurants, movies, reading, baking, painting, illustrating, sewing, traveling, decorating, working out and having friends over for dinner parties. Also I’m kind of a reality show junkie...but good ones like Project Runway and my favorite – My Life on the D List...Kathy Griffin is a goddess. What is your favorite thing to buy? Hats, shoes, watches, home goods, antiques...and of course handmade goods and art from my vendors. I'm on a sushi kick, but I go through phases...I also have a killer sweet tooth, love red velvet cupcakes with cream cheese frosting. What do you do for nightlife? What nightlife? We don't go out much, we both have such busy schedules and having the Market on weekends, means turning in at least by midnight. But when we do have time, we like just being together, watching indie films, dinner parties. I'm not into the bar scene or big clubs. I got my fill of that in college bar tending in clubs in NYC. Are you more of a thinker or a feeler? Both, I'm constantly thinking of new ways to improve what I have for my vendors and myself. I'm also a big softy...so I would definitely say both. My goal for 09 is to find a better balance for work, family and my new husband, Ed. Thanks for the interview Chris ! 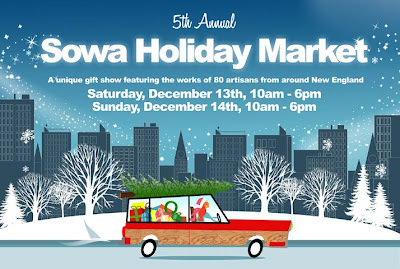 I know shoppers and vendors alike are also looking forward to the Sowa Holiday show on December 13th & 14th. what a great interview! i really enjoyed getting to know chris better and it sounds like the market just gets better and better! i certainly miss all of the wonderful opportunities it presented!